Entrevista com os Apparatjik | Watch and Listen! Entrevista com a banda Apparatjik. Watch and Listen had the chance to interview one of the most iconic bands of the nowadays: Apparatjik! 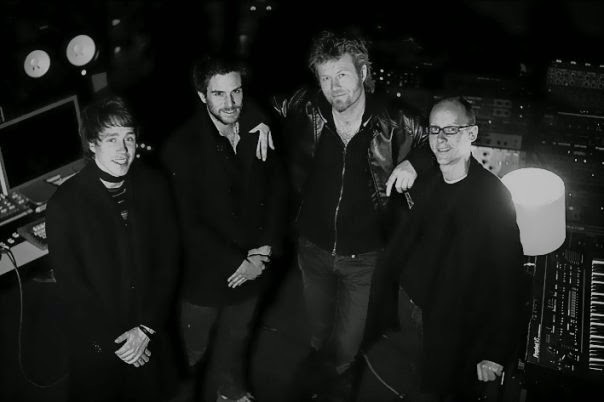 Apparatjik are a supergroup composed by Guy Berryman, bassist of Coldplay; Magne Furuholmen, guitarist/keyboardist of A-ha; Jonas Bjerre of Mew and producer Martin Terefe. With two albuns released, the band is now working on the project "Everybody Is Clapping", and Magne told us all about it. Read below the whole interview. O Watch And Listen teve a oportuniadde de entrevistar uma das bandas mais icónicas de hoje em dia: os Apparatjik! Os Apparatjik são um supergrupo constituído por Guy Berryman, baixista dos Coldplay; Magne Furuholme, guitarrista/teclista dos A-ha; Jonas Bjerre dos Mew e o produtor Martin Terefe. Com dois álbuns já lançados a banda está agora a trabalhar no project "Everybody Is Clapping" e o Magne contou-nos tudo acerca do projecto. Leiam abaixo a entrevista completa. Watch And Listen: How did you come up with the idea of starting the band? And where did you get the inspiration for the name Apparatjik? Magne Furuholmen: We were originally contacted by the Eyeon Committee, a group of intergalactic scientists to help conduct a multiverse survey on fame and the effects of prosthetic thought. Well, all bands should really have names that start with the letter A. It is the only democratic way! Watch And Listen: Como surgiu a ideia de começar a banda? E onde é que foram buscar a inspiração para o nome Apparatjik? Magne Furuholmen: Originalmente, nós fomos contactados pela Eyeon Committee, um grupo de cientistas intergalácticos que ajudam a realizar uma conduta do multiverso em torno da fama e dos efeitos do pensamento protético. Bem, todas as bandas deviam ter nomes que começassem pela letra A. Só por questões democráticas! W&L: How do you feel about being in a supergroup Magne? W&L: Como é que te sentes por fazeres parte de um supergrupo Magne? W&L: Can you tell us more about the "Everybody is Clapping Now" records? How is it going and when will we have more news about it? MF: "Everybody Is Clapping" is a continuation of projects like "Everybody Is A Pixel" where we invited people online to exhibit with us at the neue national galerie in Berlin as well as "A Square Peg In A Round Hole", where we invited our fans to help shape our second record. The Eyeon Committee is still deliberating the general effects, but as a start we have released the track on a motion picture titled yesterday, together with friends Icona Pop and Erik Hassle. W&L: Podes dizer-nos mais acerca das gravações de 'Everybody Is Clapping'? Como está a correr e quando vamos ter mais notícias acerca disso? MF: "Everybody Is Clapping" é a continuação de projectos como "Everybody Is A Pixel" onde nós convidamos as pessoas a exibirem fotos online connosco na Neue National Galerie em Berlin, e do projeto "A Square Peg In A Round Hole", onde convidámos os nossos fãs para nos ajudarem com a forma do segundo álbum. A Eyeon Committee é ainda uma deliberação dos efeitos no geral, mas como começo ontem lançámos a faixa num filme, juntamente com amigos nossos como Icona Pop e Erik Hassle. W&L: This question is for a member in particular: Guy Berryman, Coldplay’s bassist. We would like to know how did he felt about singing in Apparatjik? MF: Guy singing is like the world opening its ears for the first time but he is much too shy to say so. W&L: Esta questão é para um membro em particular: Guy Berryman, o baixista dos Coldplay. Nós gostávamos de saber como é que foi para ele cantar nos Apparatjik? MF: Quando o Guy canta é como se o mundo abrisse os seus ouvidos pela primeira vez, embora ele seja muito tímido para o admitir. W&L: What is your best memorie of an Apparatjik concert? MF: Playing in front of 50.000 people at Roskilde Festival, 90% of whom had only heard rumors about Apparatjik and never actually heard the music. It was surprisingly festive. W&L: Qual é que é a tua melhor memória de um concerto dos Apparatjik? MF: Tocar em frente a 50.000 pessoas no Roskilde Festival, 90% das quais só ouviram rumores sobre os Apparatjik nunca tinham ouvido realmente uma música nossa. Foi surpreendemente festivo. W&L: Let’s talk about inspirations. What does inspire the band most? MF: We are inspired by mathematical equations and the color pink. W&LVamos falar de inspirações… o que é que inspira a banda? MF: Nós somos inspirados por equações matemáticas e pela cor cor-de-rosa. W&L: What was the last song you listened to? And the last movie you watched? MF: We hope to listen to more music and see more films in the future, so this question is logically impossible to answer. W&L: Qual foi a última música que ouviste? E o último filme que viste? MF: Nós esperamos ouvir mais música e ver mais filmes futuramente, por isso esta questão é logicamente impossível de responder. W&L: If you had the chance of making a movie, what would it be about? MF: We already made a movie. It was titled "Pixel City" and is lo-fi reflection on Berlin as per instructions left behind by that great Apparatjik in the sky; Lazlo Moholy Nagy. It can be seen in Karlsruhe in 2015. W&L: Se vocês tivessem a oportunidade de fazer um filme, qual seria o tema? MF: Nós já fizemos um filme. Chama-se "Pixel City" e é sobre a reflecção lo-fi de Berlin de acordo com as instruções deixadas pelo grande Apparatjik no céu; Lazlo Moholy Nagy. Poderá ser visto em Karlsruhe em 2015. W&L: To conclude we really need to know: do you have any plans about coming to Portugal? MF: We are studying portuguese language with this in mind. So far we can order a circus troop and discuss the advantages of horse manure in modern farming pratice. W&L:Para concluir nós precisamos mesmo de saber: vocês tão a pensar em vir a Portugal? MF: Nós estamos a estudar português com isso em mente. Mas até agora podíamos encomendar uma trupe de circo e discutir acerca das vantagens de usar esterco na agricultura moderna.